Gaon of Sura from 832 to 843; son of the gaon (801-815) Jacob ha-Kohen ben Mordecai. Moses is reputed to have been a student of the Cabala and to have used amulets, charms, etc. (Hai ben Sherira, "Ṭa'am Zeḳenim," p. 566). Opinions of his on inheritance are preserved in a responsum contained in Harkavy's "Teshubot ha-Ge'onim" (No. 389). From this responsum, as Harkavy supposes (l.c. p. 378), Alfasi (on Ket. iv. ), R. Hananeel (Tos. Ket. 54a, s.v. ), and Isaac ben Abba Mari ("Sefer ha-'Iṭṭur," ed. Venice, p. 78a) drew their conclusions concerning Moses Kahana's opinions. Another responsum by Moses, also contained in Harkavy's "Teshubot ha-Ge'onim" (No. 432), discusses the question whether an untanned skin may be used for a scroll of the Law when there is no tanner or parchment-maker in the town to prepare it properly. 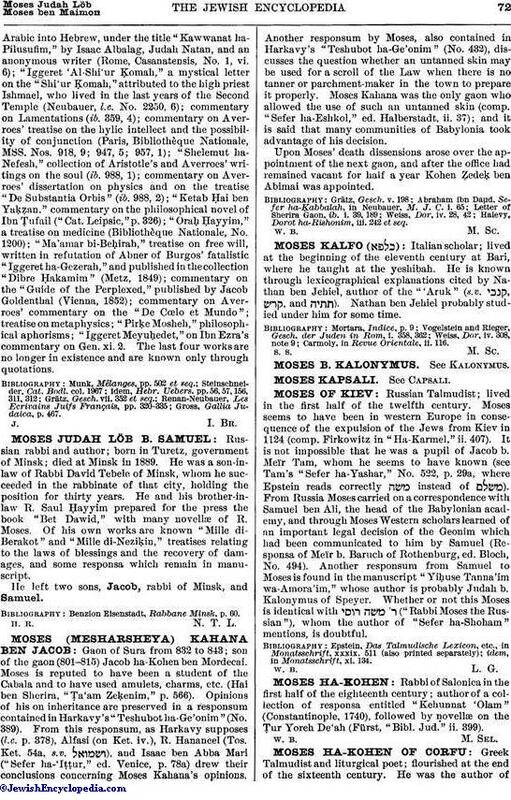 Moses Kahana was the only gaon who allowed the use of such an untanned skin (comp. "Sefer ha-Eshkol," ed. Halberstadt, ii. 37); and it is said that many communities of Babylonia took advantage of his decision. Upon Moses' death dissensions arose over the appointment of the next gaon, and after the office had remained vacant for half a year Kohen Ẓedeḳ ben Abimai was appointed. Halevy, Dorot ha-Rishonim, iii. 242 et seq.